The icy stream clawed at the bottom of the ravine. This contest of strength was initiated more than a century of millennia ago. Water versus rock. Fluid versus solid. Speed versus size. It is difficult to imagine a struggle more sublime . . . or primal. One might guess that the stream didn't have a chance. One might be wrong. I crossed the rivulet easily enough. Photo by teammember Nico Roger. I crossed the rivulet easily enough, hopping on the backs of some of the more recent casualties of the fray. Between these rocks the water danced. It knew the score. It also knew it had allies: gravity, temperature, and time. Evidence suggests that the struggle here produced a landslide of epic proportions. A slice of Kili's heights crumbled and tumbled to its base. When when it was over, a nearly-vertical wall was left standing. At least for now. It was nicknamed the barranco, Spanish for "ravine." The trail switchbacks up the Barranco Wall. I shot this image on the previous afternoon as we made our way into the Barranco Camp. This is the face that towered 850 feet above my head. It was dark, dripping, and reclusive; the top was hidden in the mist. The Barranco Wall is a challenge for many Kilimanjaro climbers. It was now ours. I contemplated the exercise behind me, the exercise before me, and the contrast between the two. 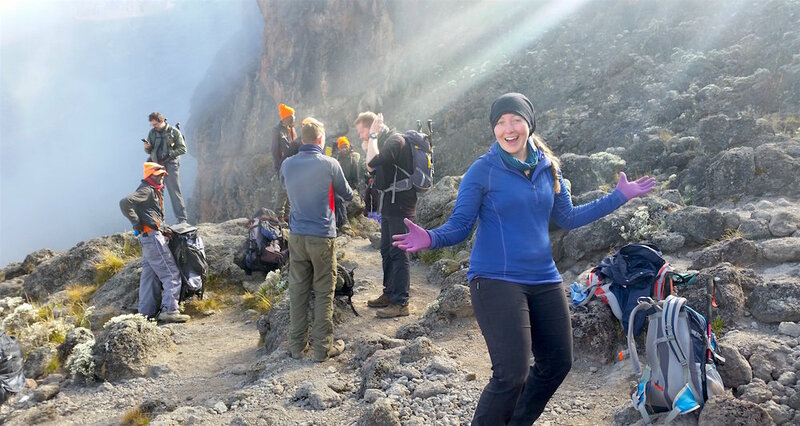 Thus far, our experience of Kili had been an engagement with a rough, and, at times, a steep trail. Trekking poles had been useful for balance and for assisting the legs. But at this moment all poles were tied into packs. Hands and arms would be needed to assist the legs. 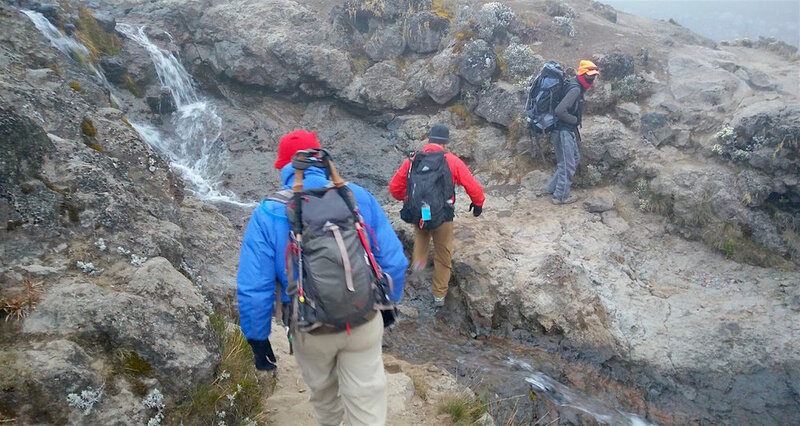 After all, the Barranco Wall is a scramble. Rachael and Yves on the scramble. Image by teammember Nico Roger. In alpine terms, a scramble represents the grey area between trekking and rock climbing. Some call it "steep walking." For others, it is "easy climbing." Whatever the case, it is an effort that requires the engagement of all four limbs. Previously we had pressed Robert for a story. He described a fall from the last climb season. The climber missed a step on the Barranco and disappeared. When the guides got to him there was little they could do. He was alive but both legs and his pelvis were broken. So was his skull. This explained the graveled helipad sitting on a shelf above Barranco Camp. The extreme ones go out that way. But, as Robert shrugged, it is probably faster if the guides carry you down. Helicopter evacuation is expensive and unreliable. In the case of the unfortunate fellow it took the helicopter seven hours to reach the 13,000' high shelf. Yours truly on the wall. The line is easy to follow. Godfred was a reassuring presence, offering advice on footwork and handholds. Photo by teammember Nico Roger. Armed with this bright news, we started up. Because it was early, we were among the first teams to the hit the wall. Bottlenecks are common at the Barranco given the number of people who climb Kili. Fortunately we were not rushed or slowed by others. We moved at our own pace across a handful of exposures. Yves steps across "the Kissing Rock." When you see it you know how it earned its name! Rachel encourages Yves from the other side. Image by teammember Nico Roger. While there was plenty of nervous excitement in the group, no one balked. No one faltered. It was a group effort, fostered by the buoyancy of Robert and his assistants. All of the team (including our porters!) met the challenge of the Wall and emerged on the top. There we celebrated, snacked, did a group photo, and breathed thanks. Rachael celebrates on the top of the Wall! Godfrey stands on the left in the light blue pants and orange cap. "God has given us a beautiful world." I turned. He was looking straight ahead. Robert was the leader. Maro, the dancer. Godfrey was the thinker. I nodded in assent. "Indeed." It was a beautiful world on a beautiful day. The scramble made a memory for a lifetime. The camera lens cannot begin to capture the rugged beauty of the Barranco. Our feet as well as our emotions were higher than the clouds. This is alpine Africa at its best!